Maintaining overhangs and eaves can be costly. Vinyl soffit and fascia can help to alleviate the need for that laborious task. They provide a beautiful finished appearance, while at the same time providing the ventilation you need to remove excess heat and humidity from eaves, overhangs and attics. 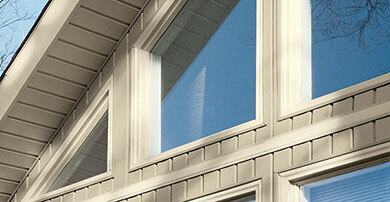 Vinyl soffit is the obvious choice for adding quality and distinction to any type of home. Soffit can help to keep your home dry in the event of rainy, windy weather. Properly maintained and installed soffit serves to repel water and wind and keep water from blowing into your home. Because of its exclusive TriBeam® System, Charter Oak® Soffit is one of the most rigid vinyl soffit products on the market. It effortlessly spans uneven surfaces and delivers an even course line while resisting sagging over long runs. Use Charter Oak soffit as an attractive, low-maintenance option for porch ceilings, overhangs or focal points where you want to create high impact appeal. For eaves, specify Charter Oak ventilated soffit paneling. Aeration openings hidden inside the panel’s grooves provide the airflow needed to reduce heat and humidity build-up in attics. Count on Quality Home Exteriors for high-quality products, expert installation, friendly service and unbeatable prices. Call us at (402) 403-5815 or fill out our appointment form today.